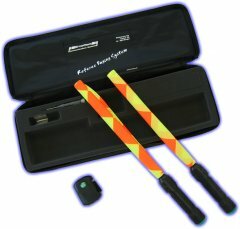 The wands that we are seeing more commonly in football are known informally as "Buzzer Flags" or, more correctly, "Referee Paging Systems". These are designed to alert the referee to his other officials, one of which may need to bring something to his attention. For example, a referee may have his back to one of the assistant referees and an off-the-ball incident such as a fight may be going on behind him. The referee won't notice the assistant however much flag waving he is doing so the assistant referee will alert the referee by "paging" him with his electronic flag. In making this alert, the referee's armband or transceiver unit will vibrate and possibly also make an audio alarm in his earpiece. The devices can be configured so that each official has a different audio tone so that the referee knows which assistant is paging him. This technology works alongside the open communication system also adopted by the officials. [This system] allows conference-type communications between 2 to 6 users over 1 km (no limit for the amount of receive only units). The main innovation of the system is the “ open microphone” communication concept; it allows every user to talk when they want, without waiting for their turn and without needing some accessory to start talking (push-to-talk button, Vox system). Now, you'll notice from the image I posted that the buzzer flags look like ordinary assistant flags. 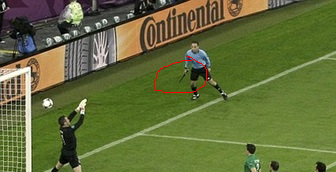 In your question, you ask why the 5th and 6th officials have these wands. What you'll actually find is that all of the officials are adopting these pager and communication systems. The 5th and 6th officals' wands look more like simply flag-handles. This is because there is nothing in the laws of the games catering for flag signals by these two goal-line assistants - therefore they don't have the yellow and red flag fabric on them. The assistant referees will accompany their paging by the mandated flag signal as well. When he press on this "Wand" then main referee feels vibration and he knows that the 5th or 6th officials wants to signal him on something. I will look for a reference later on..
Not the answer you're looking for? Browse other questions tagged football euro officiating or ask your own question.